3DAnatomica has developed interactive educational media showcasing anatomical models in ground breaking 3D technology. It’s a first in interactive learning. 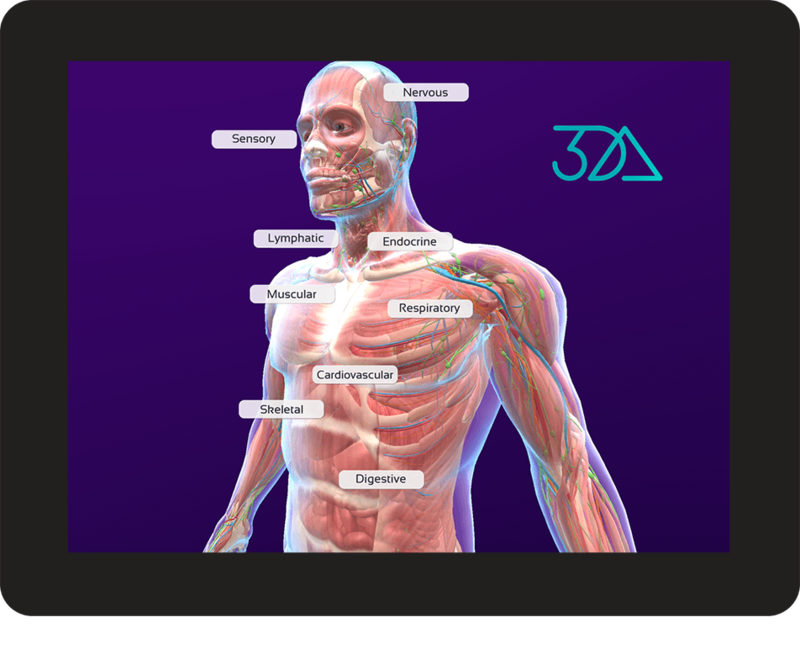 3DA’s interactive content is medically accurate and is housed in a fully functional self-contained application covering the essential anatomy of the human body, it’s functioning organs and demonstrations of the effects of disease and treatment. Our technology combines 3D media that has successfully been used in medical presentations for health associations, clinicians, pharmaceutical and educational institutions. It’s easy to use, with navigation by simple hand gestures. The Augmented Reality feature is compelling and available in customised form for embedding into pharma websites and sales eDetailers. The new technology is also a must for students of health science, nursing and general medicine. Move the above 3D image with your mouse or hand gesture. It’s a first in interactive learning. 3DA’s interactive content is medically accurate and is housed in a fully functional self-contained application covering the essential anatomy of the human body. Our technology combines media models that have successfully been used in medical presentations for health associations, clinicians, pharmaceutical and educational institutions. It’s easy to use, with navigation by simple hand gestures.The Augmented Reality feature is compelling and available in customised form for embedding into pharma websites and sales eDetailers. The new technology is also a must for students of health science, nursing and general medicine.